Deep Chabbria: One of India's youngest professional comedians, Deep was born and brought up in the bustle of Mumbai. Like that information made a difference to your life. It's ok read on. He majored in advertising to become a copywriter and happened to on the way start his own comedy collective called Comic Kaun? (What a pun! Oh yeah!) At a tender age of 21, he became a regular at premium comedy venues across the country. The downfall of his self-esteem began when he realised that after years of growing up he turned out to become a Jacky Bhagnani look-alike. Andy Reghu: A writer, a professor and a spiritual leader - Andy Reghu wears multiple hats. He is from Kurla so he automatically has a criminal past. His hobbies include substance abuse and some more substance abuse. He also claims to be a TV writer and producer and he is wondering why the hell are you reading this. 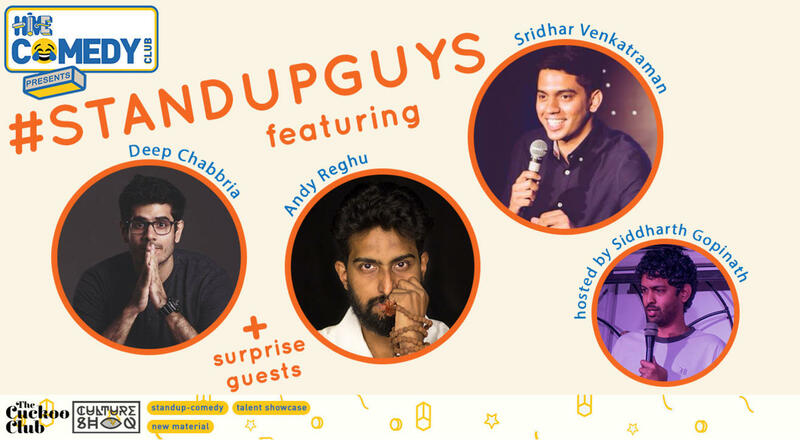 Siddharth Gopinath: Siddharth Gopinath is a former radio jockey and now standup comedian who is currently on a sabatical from chennai on account of his height being the but of all jokes in Chennai. Things havent changed for him in Mumbai as well.